Eggplants are fickle little things. It’s a vegetable that does not taste good raw and it’s absolutely useless standing alone. It needs to be stewed, smothered in sauce or served with something to dip it in. 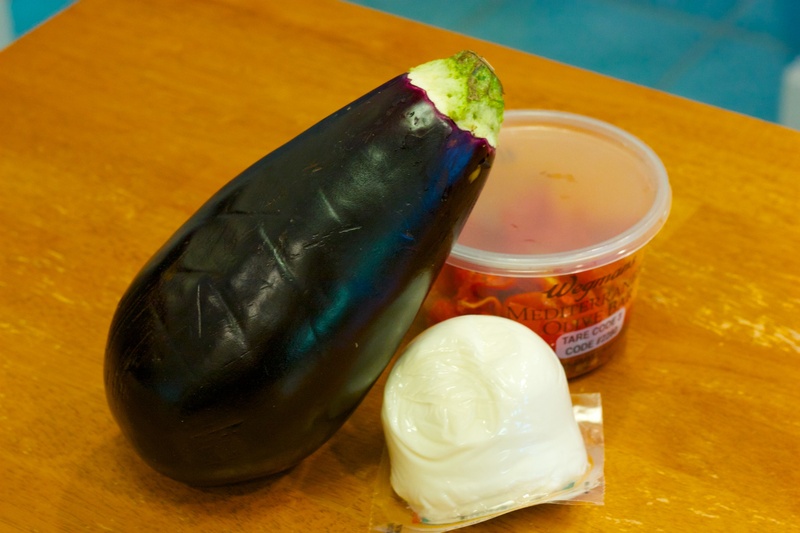 The eggplant is nutrient rich, loaded with potassium and folates. And there is nothing finer than a good, slow-cooked eggplant parmagiana. As a kid, my parents would pickle and jar eggplant to use in salads or other dishes. My favorite thing to do with them was to take a large spoonful of pickled eggplant and put it between two slices of Italian bread. Not the sexiest sandwich in the world, but full of garlicky, vinegary goodness. But I digress. The base of this recipe is Yasmin Fahr’s eggplant with spicy tomato sauce. It inspired the dish, but the end result looked and tasted nothing like her original. Harissa is a nice thought, but spicy doesn’t always play well in my house. Wegmans touts a mild harissa in its inventory, but my store in Fairmount apparently does not carry it. 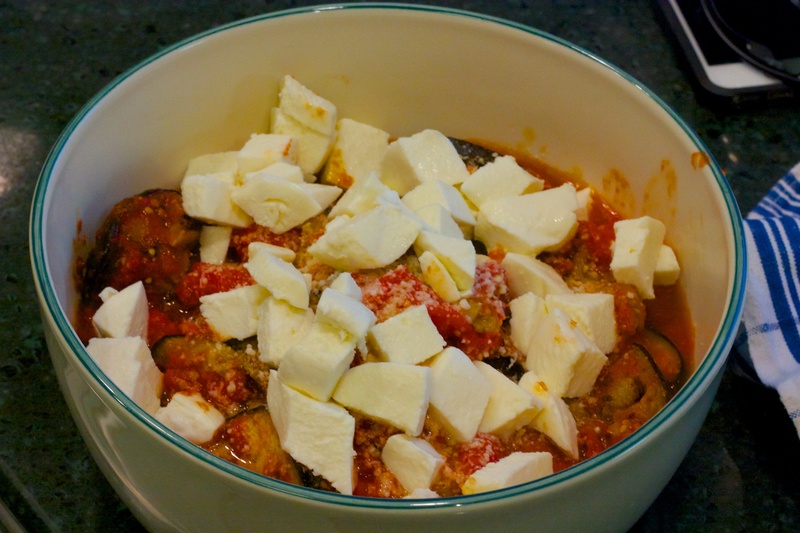 So, rather than making a Pan-Mediterranean eggplant dish, I went back to something that was a little more Italian. WHAT WORKED: Roasted tomatoes. I had some roasted tomatoes in the freezer from late summer/early fall. These are the slow-roasted variety championed by Tom Colicchio in his book Think Like A Chef. I pressed all of the liquid from them and used my immersion blender to make a paste. WHAT DIDN’T: Something is up with my large burner. I’m not cooking evenly on it anymore, so I found myself turning my pan to distribute the heat and browning power. The result was a longer cooking time than necessary. WILL IT MAKE ANOTHER APPEARANCE: I think I would like to grill the eggplant next time for a different flavor. Cut the tomatoes in the can with a steak knife, using the walls of the can as a surface if needed. 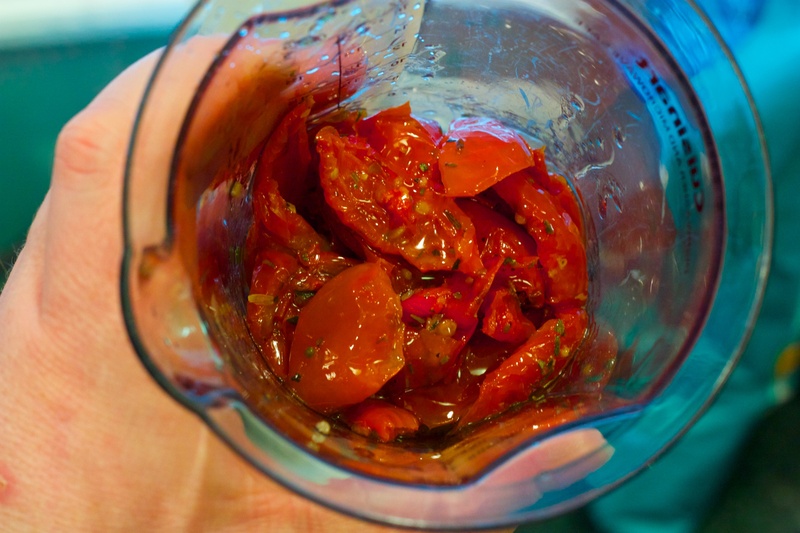 In a blender or the cup that comes with an immersion blender, puree the roasted tomatoes until it is well mashed and resembles as paste. Heat 2 to 3 tbsp. olive oil in a large skillet or Dutch oven over high heat until it shimmers. 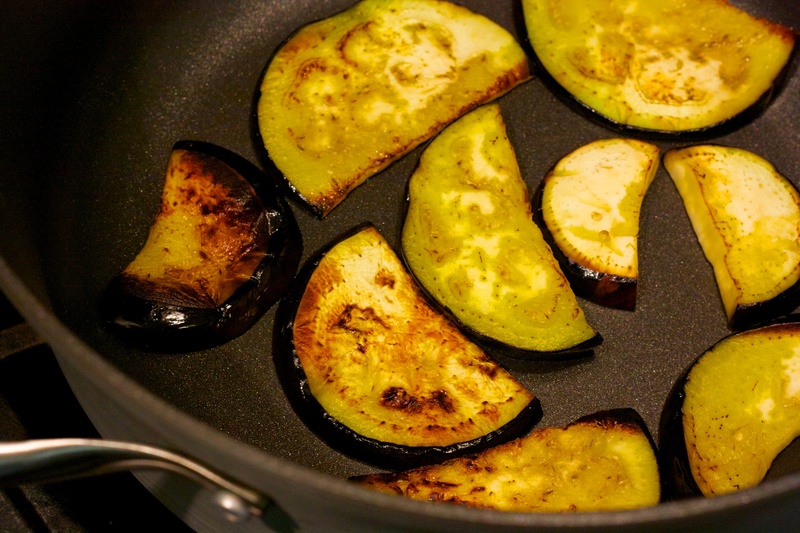 Lower the heat to medium-high and add as much eggplant as possible to create a single layer on the bottom of the pan. Cook 5 to 6 minutes and flip. Cook an additional 4 to 5 minutes until the eggplant is browned nicely on both sides. 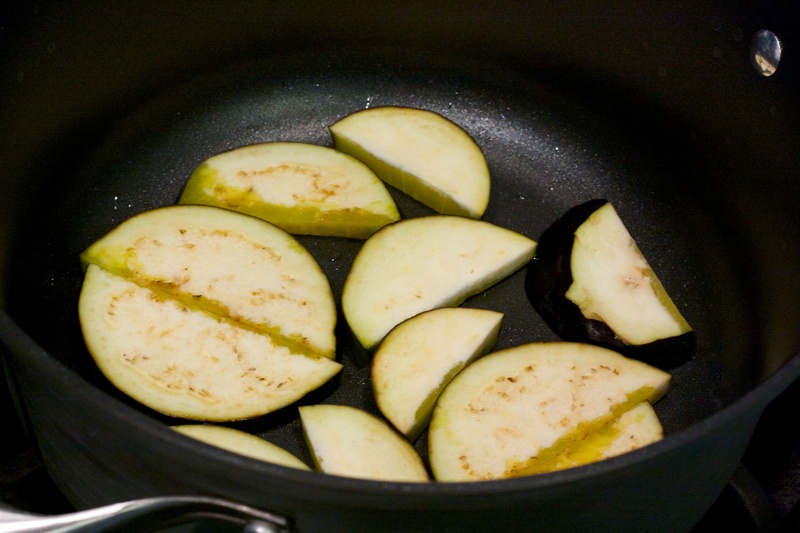 Transfer the cooked eggplant to a plate and repeat until all of the eggplant is cooked. Reduce heat to medium, add 2 tbsp. oil to the pan and heat until it shimmers. Add the garlic and cook 30 to 45 seconds. Add the roasted tomato paste and mix with the garlic. 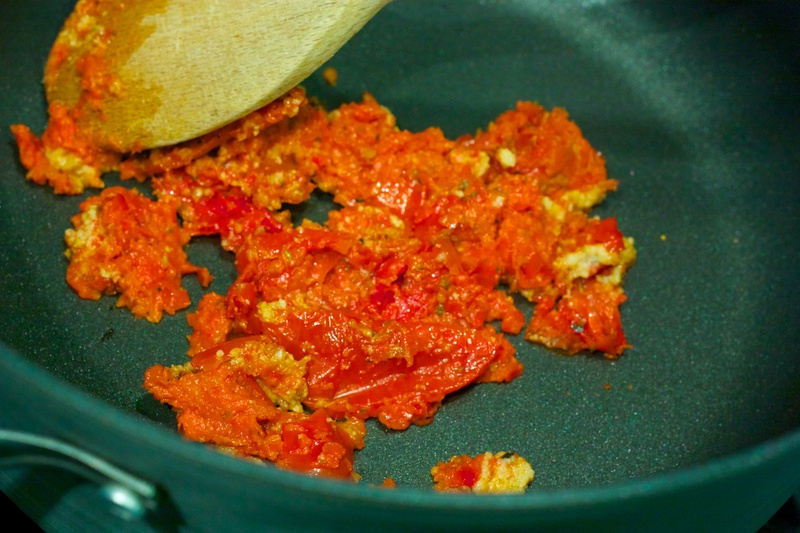 Cook until the red of the tomato begins to brown slightly. Add the canned tomatoes and use a large wooden spoon to break them up. 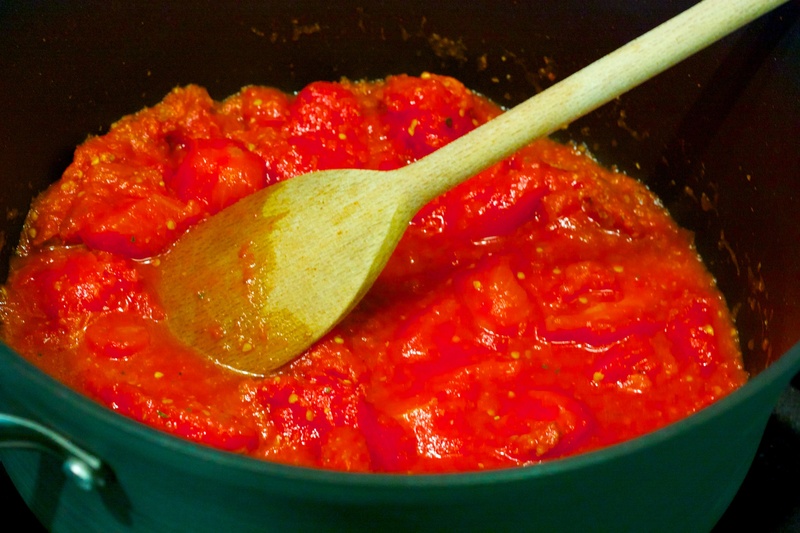 Bring to a bubbling simmer and use the spoon to distribute the paste within the canned tomatoes and liquid. In the same skillet over medium heat, add the remaining 2 tablespoons oil and heat until shimmering. Add the garlic and cook until fragrant, about 30 seconds. Add the harissa and mix together until combined. Add the tomatoes and adjust the heat until it maintains a vigorous simmer, seasoning with salt and pepper, and breaking apart the tomatoes with a potato masher or wooden spoon once they’ve softened. Cook the tomatoes 10 minutes so the liquid reduces. Return the eggplant to the pan and gently stir to coat with the sauce. Serve in the pan or transfer to a large serving bowl. Top with parsely and fresh mozzarella, and serve with crusty Italian bread.